(Photo: REUTERS / Megha Rajagopalan)The entrance to a vocational school ran by Peter Hahn, a 74-year-old Korean-American who is being investigated by Chinese authorities according to sources, is seen in the Chinese border city of Tumen, opposite the North Korean border town of Namyang, in Jilin province August 8, 2014. 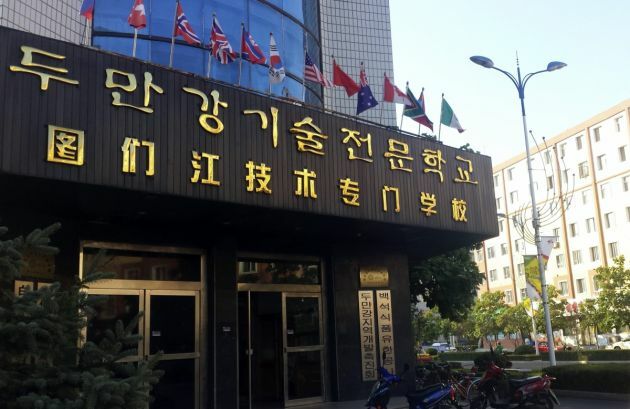 China is cracking down on Christian charity groups near its border with North Korea, missionaries and aid groups say, with hundreds of members of the community forced to leave the country and some who remain describing an atmosphere of fear. The sweep along the frontier is believed to be aimed at closing off support to North Koreans who flee persecution and poverty in their homeland and illegally enter China before going on to other nations, usually ending up in South Korea. Beijing has not charged anyone with any crime. There was no firm evidence that Hahn was involved in the so-called underground railroad, helping people escape from North Korea and clandestinely facilitating their journey to the South, usually through a third country. Authorities have arrested a Chinese pastor who strongly criticised the ongoing persecution of Christians in the country. The preacher, Rev. Huang Yizi, may face a decade of imprisonment after police laid charges of organizing a crowd to cause disorder. His supporters said the accusation was a classic example of trumped up charges to further abate resistance in the crackdown. Activists said Huang, 40, was arrested in Wenzhou, a city in eastern China, by plainclothes police officers. He was charged with "gathering to assault a State organ," a charge that activists say the government uses to silence its critics. The pastor had been openly critical of the widespread demolition campaign on houses of worship. Authorities shuttered churches and have torn down crosses across China in the past months. The arrest of Huang comes over a week after bloody confrontations between police and Chinese Christians erupted in Wenzhou. Police closed down Salvation Church there despite objections from churchgoers. Chinese Christians belonging to the Salvation Church kept vigil at the church to prevent authorities from taking the down its cross. Church officials managed to strike a deal with the local government that it will not tear down the cross, but police swooped on the structure days after the agreement. Days before Huang's arrest on August 2, the pastor told the Hong Kong-based South China Morning Post he was concerned about the fate of Christians in the country given the crackdown. He said he expected to be "arrested" because of his stiff opposition to the persecution of Christians there. Activists believe Huang's arrest was related to his purported attempts to organize churchgoers to prevent authorities shutting down the Salvation Church in Wenzhou. While believers and preachers were being arrested and charged, Huang's predicament is considered to be serious due to the potential prison sentence authorities and mete out. People who knew Huang attested to the pastor's dedication to the church, even shrugging off threats from authorities. "For the past half year, Huang has received constant threats from police," a Christian told the Telegraph. "Huang has shown outstanding loyalty to God and bravery at a difficult time," said a friend of his. Christians spoke to the Telegraph on condition of anonymity for fear of reprisal from the government. "He is a very good church leader, a man of vision who is strong-willed and tolerant," he attested.